What did the dog say to the flea? Stop BUGGING me! While this may be a corny little joke, it rings true in so many situations! Have you ever felt that nagging frustration of trying to get rid of something that just won’t go away? Spring is here for Woodbury, MN residents. Along with blooming flowers comes the ever so daunting PESTS. For those of you who have tried to get rid of pests like ants or spiders in your home, you know it can be a nightmare! Bottom line, over the counter products don’t always do the trick. If your home has a pest problem, it’s time to call Eco Tech, Woodbury, Minnesota’s best solution offering effective extermination methods. Why Use a Professional Exterminator? Like the dog that can’t get rid of fleas, homeowners will try and try every different method short of poisoning themselves to get rid of bugs in their home. Unfortunately, nothing works. 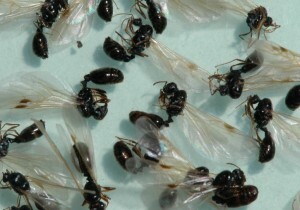 This is mainly because there are so many different types of species among each pest. In order to effectively treat the problem, our staff is thoroughly trained and knowledgeable on the types of pests they are dealing with. We use effective extermination methods that get rid of your pest problem for good! We are also well aware that most insect extermination products can be very harmful to the environment and to your family and pets living in the home. For this reason, Eco Tech only uses products that don’t cause harm to the environment or the people and animals around it! Our natural pest control treatments set us apart from any competitor around! We want to help you in any way possible but we have to hear from you first! Give us a call and we can find a flexible time that works for you! We have a 24-hour number just in case you find yourself with a pest emergency that warrants immediate attention! Detective! With our highly trained investigative skills, a professional team member will come to your home to identify the problem, determine where they are coming from, and determine a treatment plan to eliminate the pest and prevent it from reoccurring! Exterminate! Once we set a convenient date, we will use our effective extermination methods to treat your home. Once elimination has occurred, we can repair any of the damage caused by the pests! Prevention! We want to make sure this doesn’t happen again! We offer a four-year warranty to back our promise in that we have prevented this problem from reoccurring! So if you notice pests in your home that are bugging you, it’s time to stop scratching yourself and call a professional! If you live in Woodbury, MN, call Eco Tech today at 763-785-1414.